Summary: Belinda Williams had a terrible crash! Her helmet worked. I consider myself an experienced cyclist. I know the laws, and I generally follow them, although I have been known to break speed limits during descents. I follow the same rules as apply to drivers. I even used to write a weekly column on cycling, with a strong focus on laws and safety. My bicycle was also my chosen and ONLY form of transportation. September 18th, 2011, would be a ride like no other. It was to be my last group ride of the season, riding my favorite ascent, Mount Evans. The road on Mount Evans is the highest paved road in North America, reaching an elevation of more than 14000 feet. The road is littered with ruts and potholes, but having ridden it as often as I did, I knew every turn, rut, and pothole. The forces I couldn't control were those associated with Nature, and even there I'd thought I'd encountered and could handle everything... Wind, rain, hail, snow, lightning striking close enough to feel the electricity and smell the ionized air, etc. I was wrong. I wasn't 100% that brisk September day, and headed back down the mountain early, albeit not alone. One other rider accompanied me. On the descent, I found myself battling strong head winds, and going far slower than I typically would descend the mountain. Even so, my friend fell behind and lost sight of me. On a straight section I would usually reach speeds of around 45 mph, I found myself barely able to break 30 mph. However, as I approached the turn at the end of the straightaway, the headwind suddenly became a strong tailwind, nearly doubling my speed. When I applied my brakes, I began to skid, so I reduced pressure to pull out of it. However; I found myself unable to slow down. When I realized I wouldn't successfully negotiate the turn, I attempted to fall on the incline. Unfortunately, I was now riding through cross winds, which took me in the opposite direction, straight over a cliff. I plunged 30 feet to the granite boulders below. I'm certain I was briefly unconscious. When I was next aware, I found myself flat on my back on the boulders. The road above was invisible to me, so I knew I was invisible to it. I called out for my friend, but knew he was already well past. Likewise, I knew my other friends wouldn't hear me yelling, as the noise of the wind during their descent would drown out all else. It was cold, and cars would have their windows closed. I found myself unable to roll over, and unable to reach my cell phone. My only hope would be another cyclist coming up the mountain, or if my friends searched for me in time and found me. I yelled for an eternity. I grew weak, sleepy, and cold. I almost gave up. Finally, a cyclist from Switzerland heading up the mountain heard me and flagged down some help. It had been 45 minutes since my accident. I was airlifted to the nearest trauma center. I had 9 spinal fractures, all in my neck and thoracic spine, including the top two vertebrae in my cervical spine. My rib cage and right scapula were shattered. Both lungs were punctured, and I had severe lacerations to my left kidney and spleen. My internal bleeding was massive. 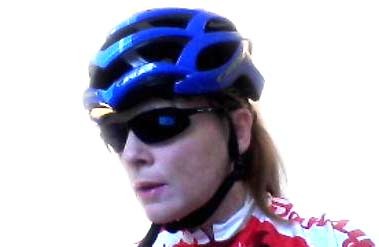 My head, however, had a single gash, and in a location that wasn't protected by my Giro Atmos helmet. The helmet itself had more than a dozen cracks and multiple crush zones. While a fall like that far exceeds CPSC standards of testing, there is little doubt that the helmet saved my life. I still have it. I spent 10 days in ICU, and nearly a month in hospital. My injuries were consistent with a fall from that height. However; the mild traumatic brain injury I suffered was minimal. I've since had to have spinal surgery to remove bone fragments and damaged disks from my neck, fusing 4 levels. I'm on the mend, though. I can walk, my faculties are intact, and I even seem to be regaining coordination in my left hand. I remain in severe pain, but I'm alive. I'll likely even ride again! Life is good.